Shop Sabian HHX Evolution Performance Set 14/17/21 Free 19 Brilliant Finish from AMS with 0% Interest Payment Plans and Free Shipping. Free 19" HHX Evolution Crash! $349 Value! The Sabian HHX Evolution Performance set is sonically matched by the Artisans in the Sabian Vault exclusively for AMS. 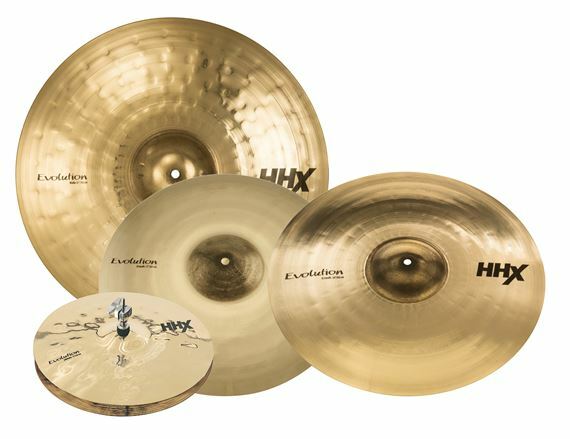 The Sabian HHX cymbal set in brilliant finish features 14" HHX Evolution Hi-Hats, 17" HHX Evolution Crash, 21" HHX Evolution Ride and a FREE 19” HHX Evolution Crash. HHX Evolution was designed with sonic perfectionist Dave Weckl. Weckl would settle for no less than a cymbal line with buttery feel and glassy attack. Sabian craftsmen delivered and the Evolution line remains a standard to this day. Sabian delivers Modern Dark tone at all times. Protected by Sabian Two-Year Warranty. Great product and bundle deal! Amazing customer service, super fast delivery. A wonderful value in this item. Great product for anyone who can't buy individually but want great sounding cymbals. Definitely bang for your buck with this one.